GITI Tire, the 10th largest tire company in the world and one of the most successful in Asia, announced in June 2014 that it would establish its first North American manufacturing facility in Richburg, South Carolina. For the Singapore-based company, this will be its first manufacturing facility built outside of the continent of Asia. “This significant investment represents our strong commitment to customers in North America. This is a key milestone for GITI Tire and an important part of our growth strategy worldwide. 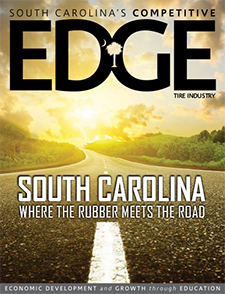 Existing business and strong demand for GITI Tire’s passenger and light truck tires in North America have made this significant investment in South Carolina possible,” said Enki Tan, executive chairman of GITI Tire Group, in a statement. The Chester County site is an excellent opportunity for both the company and the people of South Carolina. According to the South Carolina Department of Commerce, the company plans to invest $560 million and create 1,700 new jobs over the next decade. A number of elements persuaded the company to locate in South Carolina, including the area’s workforce and training opportunities provided by readySC™ and the technical college system. Through collaboration with GITI subject matter experts, readySC will craft a customized recruiting and training solution designed to meet the initial hiring and production needs at the new facility. Understanding the unique needs of a start-up company is crucial to the development of a successful recruitment and training strategy, and this first step begins with the Discovery Phase of readySC’s 3D Process. For GITI Tire, this required a two-week Discovery trip in March 2015 to study existing facilities in Asia. Marianne Borders, Area Director for readySC, led the Discovery team, which consisted of curriculum development and design experts. The readySC team traveled to select facilities in Indonesia and China that provided the best model for operations at the new South Carolina location. The first days of the visit focused on production at the PT Gajah Tunggal Tbk facility in Tangerang, Indonesia. GITI Tire owns a 49.7% stake in the company, which manufactures tires for consumer cars and sports utility vehicles, commercial vehicles, off-road vehicles, specialty machinery and motorcycles. From there, the team traveled to Hefei, China to tour the first and largest GITI facility in the country. Located in the Hefei Economic and Technology Development Zone, GITI Tire Anhui produces tires for various vehicle types and road conditions. Major R&D and supply chain facilities are also located together with the plant. A leading goal of these plant visits was to observe critical steps in the production process from the reception of raw materials to tire storage and shipment and the different jobs associated with each of these various methods. The Discovery team focused on the primary development questions, including: what are the positive aspects that need to be duplicated at the new facility? What are the quality standards that will be expected? What are the most challenging and/or difficult tasks that will need to be learned for the job? During these plant visits, the team also observed differences and similarities between the culture at the existing facilities and identified what is planned for the South Carolina facility. From Hefei, China, the Discovery team then traveled to Shanghai to the company’s Chinese headquarters to meet with GITI Tire leaders. By the conclusion of the meeting, readySC and GITI had defined a preliminary timeline for recruitment and agreed on an effective pre-hire training strategy. The output from this Discovery Phase will be used to Design and Deliver customized training that helps to maximize GITI’s success in North America. GITI Tire Group, headquartered in Singapore, has been in the tire business since 1951. GITI Tire operates eight manufacturing plants and produces a broad range of tire products, serving major original equipment vehicle manufacturers, auto-service outlets, tire dealers and consumers in more than 130 countries worldwide. The Chester County facility represents GITI’s ninth manufacturing plant in its global system and is the first greenfield project in North America for GITI Tire. The plant will produce passenger and light truck tires for the replacement and original equipment markets, and should be operational in 2017. During the first phase of production, the plant’s capacity is expected to be five million tires annually. GITI Tire plans to further increase production capacity in response to future market demand and conditions. The plant plans to generate 1,700 new jobs over the next 10 years.